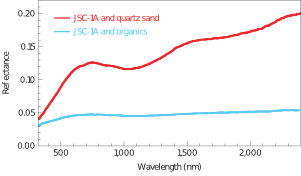 Figure 1: The red curve illustrates the reflectance of Moon-like material mixed with organic free quartz sand and the blue curve shows the reflectance for the material mixed with organics (sugar) after the impact of the projectile. The impact causes the production of carbon for the material mixed with organics and its reflectance is lower. Today’s Astrobite presents an explanation of a feature of the Solar System‘s smallest and innermost planet: the darkening of Mercury. So far astronomers could get no satisfaction in explaining the fact that Mercury’s surface is darker than the Moon’s. In principle, iron is the most common cause for darkening of bodies without an air atmosphere. The problem for Mercury is: Mercury’s surface consists of less iron than the Moon. Thus, there has to be a material different from iron that “paints” Mercury black. The authors of the article propose that carbon, instead of iron, can darken the surface of Mercury sufficiently. Indeed they do experiments at NASA’s Ames Vertical Gun Range, where they shoot projectiles onto Moon-like material mixed with/without organics. When the projectile is shot on the material with organics, the heat induced by the impact causes the formation of carbon. As you can see in Figure 1 (Figure 3 in the paper) the reflectance of light from the surface of the two materials is significantly lower, when carbon is present and the values are consistent with the darkest areas on Mercury. At this point you may ask: Fine, but why should there be more carbon on Mercury than on the Moon? The explanation of the authors is based on two observations. Comets consist on average about 18% of carbon. The number of cometary impacts per unit area decreases roughly inversely with decreasing radial distance from the Sun. Considering that enough of the impacting material retains on Mercury, the authors suggest that the larger amount of meteoritic impacts enrich the surface of Mercury more in carbon than the surface of the Moon. To be precise, they consider only small meteorites – so called micrometeorites – and they assume a constant spherical size of 0.25 cm and constant speed of 20 km/s. You may argue now that this is a drastic simplification since meteorites have varying sizes and corresponding higher speeds. The authors are aware of that, but they argue that larger objects have higher speeds such that they will not be captured by Mercury’s gravitational field. Thus the impact of larger objects is negligible and micrometeorites are the dominating objects for impact. Figure 2: The plot illustrates the probability distribution (black), the amount of mass retained on the surface obtained from the resolved micrometeorites for Mercury (dark blue points and curve) and the Moon (red points and curve) for different impact angles measured with respect to the horizontal axis. In comparison the results obtained from tracer particles for Mercury are plotted as light blue diamonds. The authors test their idea with a Monte Carlo code, where they compute the percentage of retaining meteorites on the Moon and Mercury for different impact angles. 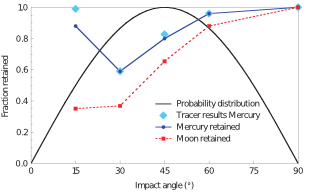 In Figure 2 of this Astrobite (Figure 1 in the paper) you can see the probability for a micrometeorite of certain impact angle and the mass fraction of the objects that retain on Mercury. The impactors (micrometeorites) are resolved by several grid cells in the code. The drop in the retainment fraction at 30° reflects the fact that the micrometeorite has relatively seen more energy compared to the target than at different angles. The results are also similar for tracer particles that follow the movement of impactors during the simulation. The authors explain the differences at 15° with asymmetric shock conditions such that some mass of the impactors does not stay on the surface. However, this process is – in contrast to the first method – not resolved by tracing the micrometeorites as single objects by tracer particles. Altogether, you can see that a sufficient amount of mass from the impactors stays on the surface (on average 83 % for Mercury and 63 % for the Moon) and the authors conclude that approximately 50 times more carbon-rich micrometeorites are delivered to Mercury than to the Moon. Together with the result from the shooting experiment that carbon darkens the surface efficiently, micrometeorite impact may cause the darkening of Mercury. In other words: Falling stones paint it black. An asteroid rotation factory Simulating the unseen: learning about Jupiter’s unknown impactor through simulations Using observations from home to improve the transit method Are Extrasolar Worlds More Likely to Be Water-rich? Interesting post! Do the authors’ findings from Figure 1 and the abundance of micrometeorites delivered to Mercury agree with the actual darkening we see? Hi Jennifer! Thanks for your compliment. The reflectance agrees with what is found for the darkest terrains on Mercury. I added this to the post. Thanks. Thanks for this neat post! I wonder if — in addition to the decreasing number of comet impacts as bodies get farther from the Sun — the Moon’s smaller size makes it even less likely to be hit with iron-rich comets. Thanks Anne! Yes, you’re right. The probability of impact per unit surface area decreases with increasing radial distance. Another great application of Monte Carlo methods!! And interesting that I didn’t know Mercury was getting darker. If the claim is that Mercury has more carbon than the moon because it is closer to the Sun and therefore experiences more Carbon-heavy impacts, is there evidence to extend this pattern beyond just those two bodies? For example, Does Mercury have more surface carbon than Venus, Venus than Earth, and Earth than Mars? Are the life processes on Earth too complicated for this analysis to be meaningful? Hej Zoey, thanks for your comment! I’m not aware of further comparisons, but I think a problem of comparing it to Venus and Earth is that these planets have atmospheres. While you mention that iron is not a possible source for the darkening, are there any other reasonable competing theories? Or is impact-related darkening generally accepted and this paper is just demonstrating a fairly established theory? Thanks for the comment, Chris! This paper presents (to my knowledge) a completely new idea, which offers a promising explanation. Apparently, the impact flux has been underestimated in the past. Iron does still contribute to the darkening, but it cannot explain the difference between Mercury and Moon. This is an interesting discovery! Why do iron and carbon cause bodies to be darker? Does it have to do with the way they absorb light? Thanks for your comment, Erin! Yes, as you say and as you can see in figure 1, the presence of carbon (and also iron) reduces the reflectance and thus makes the body appear darker. Why does a higher percent of mass from impacts (“on average 83 % for Mercury and 63 % for the Moon”) remain on the surface of Mercury than the moon? Am I misreading this, or is there something about Mercury that keeps the products of impacts on the surface at a higher-than-usual rate? Good question, Sam! The authors do not comment on this, but I assume it simply reflects the fact that Mercury is more massive. Thus, its gravitational attraction force is higher and the velocity required to leave the environment, where the micrometeorites are attracted (escape velocity) is higher (Mercury: 4.25 km/s, Moon: 2.38 km/s). Consequently, it is easier for falling micrometeorites to escape again from the Moon than from Mercury. Are there other objects (asteroids, KBOs, etc.) that show similar reflectance levels to Mercury or is it truly an anomaly in our Solar System? Thanks for your comment, Jonathan! I assume that asteroids appear to be darker since they are relatively rich in carbon. Indeed, carbon is considered to be delivered by micrometeorites, i.e. by cometary and asteroidal debris material. This is cool! Also didn’t know that Mercury was getting darker. Surface area aside, are the Moon and Mercury equally likely to be impacted by comets? Also – do you know if we have we seen any evidence of the moon darkening? Thanks for your comment, Emily! Darkening by iron is rather well-known for the Moon. The Moon consists of highlands called terrae and darker plains called maria. Maria is enriched in iron, which causes the darkening. How much surface area does one of these micrometeorites darken once impact occurs? In other words, how many impacts does it take to make a significant change in the surface color over a wide area? How much “darker” has mercury been getting over the past few years, and how have astronomers noticed this? Very interesting post! I did not know this effect existed and I am pretty impressed by how the model could explain the differences between Mercury and the Moon! How did you come up with the hypothesis that the darkening could be due to carbon instead of iron? Did you have to test many materials before settling on this one? We only present published astrophysical articles. I assume that they looked for other materials than iron and since Carbon is present they tested the possibility of it as a marker.